NO manual adjustment is needed to produce consistently uniform corn tortillas and chips with Heat and Control Pty Ltd 's new Paragon Automatic Weight Control Sheeter. Conventional sheeters require constant manual adjustment of the roll gap to compensate for variations in masa density and moisture. 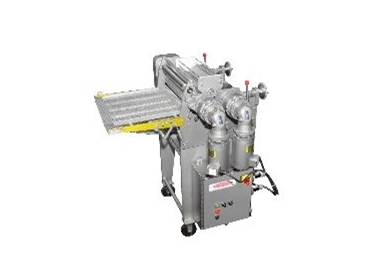 Until now, processors have had to accept the labor-intensive art of sheeter adjustment, and the resulting inconsistencies in cooking and finished product. Paragon Sheeters equipped with optional Automatic Weight Control eliminate these problems. Actual product piece weight, rather than sheet thickness or operator guesswork determine paragon's roll gap. The operator simply places a product sample on one of the scales located on each side of the sheeter. The roll gap then automatically adjusts to maintain the pre-programmed target weight. Settings for different products are retrieved from a pre-set menu via touch screen from the sheeter's PLC control system. Rugged construction also assures Paragon Sheeters deliver consistent product. Large diameter rolls are mounted between 1 1/4" thick stainless steel side frames. The hinged rear roll support pivots on bearings to maintain precise roll gap and alignment. Differential speed rolls require only one stripping wire on the front roll, while direct drives eliminate the maintenance required for drive belts, sprockets and chains. Patent-pending design features include rolls that can be removed in minutes, instead of hours. The unique roll-contoured discharge conveyor belt eliminates product fold-overs and stress fractures, while a continuous lump remover maintains product quality. Open frame washdown construction greatly reduces cleaning time. Paragon Sheeters are available in 22", 31", 39" and 48" widths for products from corn, potato and grain-based flours. The sheeters are also available for oven-mounting or as portable units. More information is available at www.heatandcontrol.com.